Move oven rack 4 inches from broiler. Heat oven to 400°F. Line large rimmed baking sheet with foil. In 4-quart saucepan, heat 1 tablespoon of the oil over medium heat. Add onions, 1/8 teaspoon of the salt and the red pepper flakes; cook 6 to 7 minutes, stirring occasionally, until onions are softened and lightly browned. Add quinoa; cook over medium heat 1 to 2 minutes, stirring occasionally, until fragrant. Add tomatoes and water. Heat to simmering over high heat, stirring occasionally. Cover; reduce heat to low. Cook 18 to 23 minutes, stirring once, until liquid is absorbed and quinoa is thoroughly cooked. Remove from heat; stir in 1/4 cup of the cheese. Meanwhile, place chard on baking sheet. Drizzle with 1 tablespoon of the oil, and sprinkle with remaining 1/8 teaspoon salt. Toss to coat; spread in even layer. Bake 5 to 7 minutes or until wilted. Transfer to medium bowl; set aside, uncovered. Replace foil on baking sheet. Rub steak with remaining 1 tablespoon oil, then rub in steak seasoning. Place on baking sheet. Broil with top 4 inches from heat 3 to 4 minutes on first side. Turn; broil 2 to 4 minutes or until steak reaches desired doneness, 145°F for medium-rare or 160°F for medium. Transfer to cutting board; cover with foil tent. Rest 5 minutes; slice very thinly across the grain. 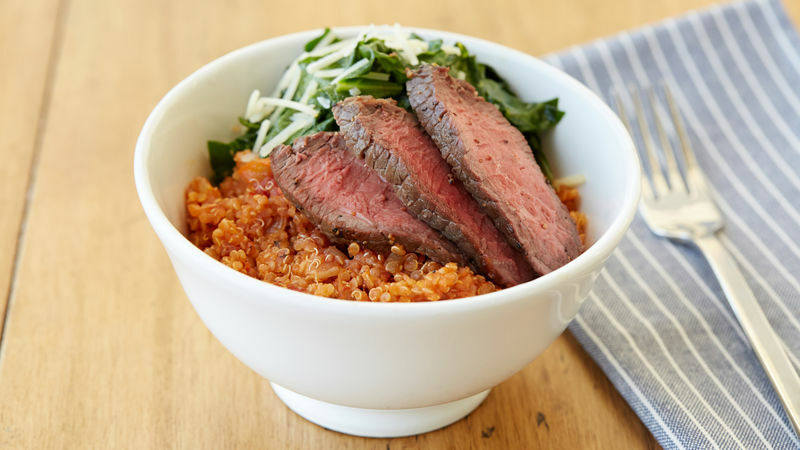 Divide quinoa mixture among 4 bowls; top with steak and chard. Sprinkle with remaining 1/4 cup cheese. Having vegetarians and meat-eaters at the same table? Just leave the steak off for a veggie-friendly version! The method for roasting the chard is great for any sturdy green, from kale to mustard greens.